If you’re anything like the more than 2,000 Americans surveyed by NerdWallet this fall, you likely spent more this holiday season than in 2015 or 2014. On average, Americans planned to spend $657 on gifts during the holidays this year — 24 percent more than 2014, according to Nerdwallet’s 2016 Consumer Holiday Shopping Report. But that’s not a bad thing, says National Retail Federation chief economist Jack Kleinhenz. The more we spend, the better the economy performs: Consumer spending accounts for nearly 70 percent of the GDP. But where does holiday shopping fit into that statistic? But we do know that for retailers, a lot hinges on this time of year: About one in every five sales is made in November and December, he says. And right now, the economy is doing well. More people are working, and wages have increased faster than inflation. In September, consumer confidence also rose to its highest level since 2007, according to data released by the Conference Board, a business association. But it isn’t as easy to answer from a consumer standpoint because consumer spending also encompasses all of the services you pay for, like cable, eating out and health insurance. And only one-third of consumer dollars go toward purchasing goods like furniture, clothing, food, snow shovels, Kleinhenz says. Still, we can say with certainty that holiday shopping is up. Americans are spending more, based on the NerdWallet report, and Kleinhenz says data shows retailers will see about 3.6 percent more sales than last year. Statistically, the Saturday before Christmas — Dec. 17 this year — is the biggest shopping day of the season per consumer surveys. The impact of holiday shopping doesn’t end right before Christmas either. Dec. 26 is one of the busiest shopping days of the year, Jespersen says. “Everyone is going back to the store and returning items,” she says. And because some stores only give merchandise credit, there are still lots of sales to be made. Kleinhenz also says that January is becoming a big month for consumer spending thanks to gift cards and after-Christmas sales. “It will be a positive development as move into 2017,” he says. 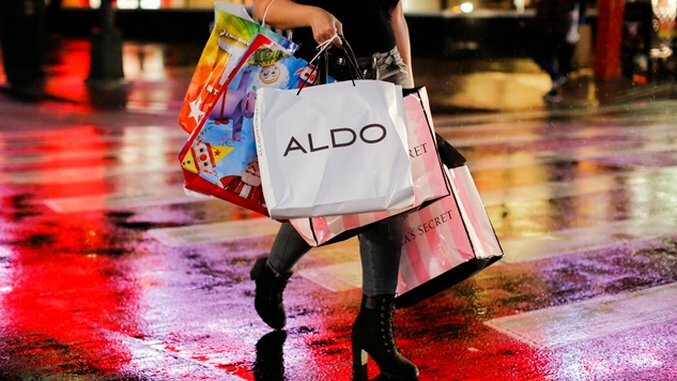 Other holiday shopping trends are still shifting. Retail prices are down, thanks to a stronger dollar and more retail competition. People aren’t buying less, though. In the NerdWallet survey, millennials were spending less for holidays gifts than other generations. But that’s partly because they don’t have as many credit cards and some don’t have families yet. That will all change. “Once they get older and make more, they are likely to spend more,” Jespersen says. Still, millennials are also a unique generation: They are more impulsive shoppers and they overshoot their budget more often. “Some of their habits might become more commonplace and prevalent,” Jespersen says. And while shopping online has played a huge role this season, Jespersen says, according to the NerdWallet report, only six percent of those surveyed did their holiday shopping online exclusively. “What that statistic can tell us is there is still a market for shopping in-store,” she says. Jespersen also says the survey indicated that shoppers feel overwhelmed this time of year (maybe rightfully so if they are spending more than $600). And the majority of Americans weren’t sure they were getting the best deals. But there are ways to prevent that, she says: Plan ahead and do your research. But, for the sake of the economy, keep shopping.